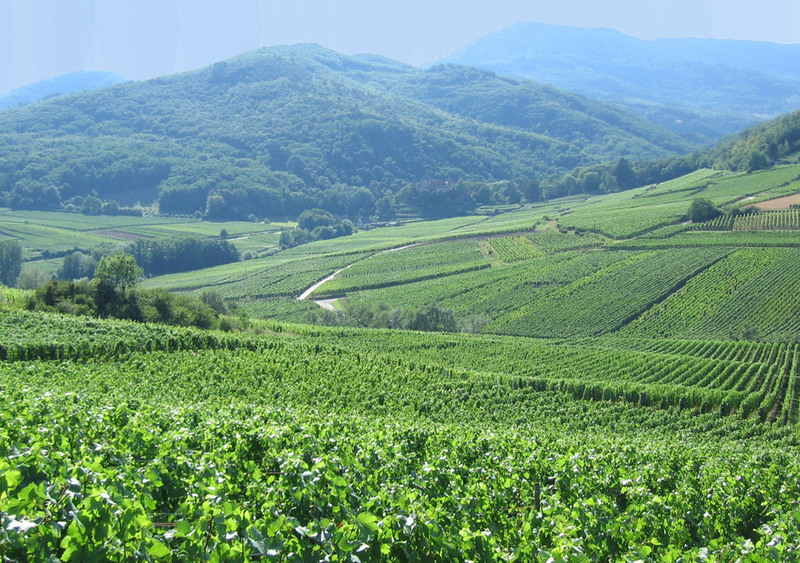 Tactical Avian Predators uses licensed Falconers with a minimum two year apprenticeship. Falconers use ancient falconry techniques when working with and training falcons to chase and haze pest birds. Kathleen Tigan has had a fascination with, and love for, all animals from her very early years. At home, she has trained several breeds of her working stock dogs and horses to actively participate in range land roundups with friends. Kathleen's interest in raptors reached a peak in 2006 when she began working with Dr. Jean Cypher at the Rowena Wildlife Clinic located in The Dalles, Oregon. 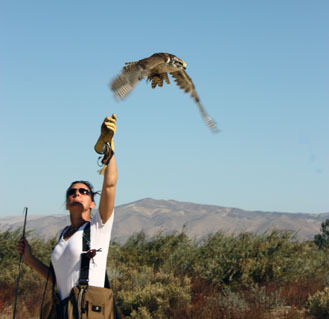 To develop her skills in husbandry and raptor handling, she volunteered at the Raptor House Rehabilitation Center in Yakima, Washington, and the Rowena Wildlife Clinic in The Dalles, Oregon. To further her knowledge, Kathleen also attended the International Wildlife Rehabilitator Basic Wildlife Rehabilitation seminar sponsored by the Cascade Raptor Center in Eugene, Oregon, and an internship for the Bird Of Prey program at the Oregon Zoo. Kathleen is also a licensed falconer. Recently, Kathleen worked as the Assistant Director of the Columbia Gorge Discovery Center in The Dalles, Oregon, where in addition to her administrative responsibilities, she initiated the Birds Of Prey program, which included developing raptor handling manuals, training volunteers, and managing the daily raptor demonstration programs. She also managed & administered the daily husbandry regimen for the bald eagle, red tailed hawk, peregrine falcon, great horned owl, American kestrel, and saw-whet owl maintained by the Discovery Center. In her travels from Oregon to Texas, where she grew up and where many of her family members live, she visits wildlife centers along the way to continue to add to her understanding of the care and maintenance of animal life. Jim Tigan has 33 years of experience handling raptors and has been a licensed Master Falconer for 29 years. His extensive experience includes hawking and training the American Kestrel, Merlin, Barbary Falcon, Prairie Falcon, Peregrine Falcon, Gyr/Peregrine Hybrid Falcon, Lanner Falcon, Saker Falcon, Gyr Falcon, Goshawk, Coopers Hawk, Sharp-shinned Hawk, Ferruginous Hawk, Harris Hawk, Red Tail Hawk, Auger Buzzard, Eurasian Eagle Owl, Great Horned Owl, Bald Eagle, and Golden Eagle. Jim worked for the World Bird Sanctuary at Travis Air Force Base as a Bird Air Strike Hazard Technician and founded the world-famous Alaska Raptor Rehabilitation Center in Sitka, Alaska while stationed in the US Coast Guard. 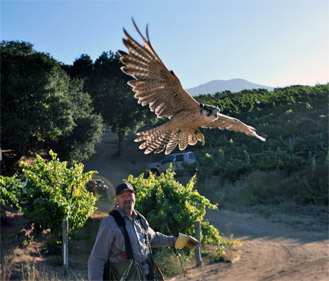 Jim founded Tactical Avian Predators in 2002 and has worked for The Lodge at Pebble Beach, La Costa Resorts and Spa, New United Motor Manufacturing, Inc, and currently protects the grapes for Hahn Family Vineyards. Tactical Avian Predators has developed and implemented a Feline trap/neuter/inoculate/release program for refineries in Torrance, CA in addition to a Falconry-based bird control program for the City of San Francisco at their domestic water supply at Moccasin Reservoir at Hetch Hetchy, CA.